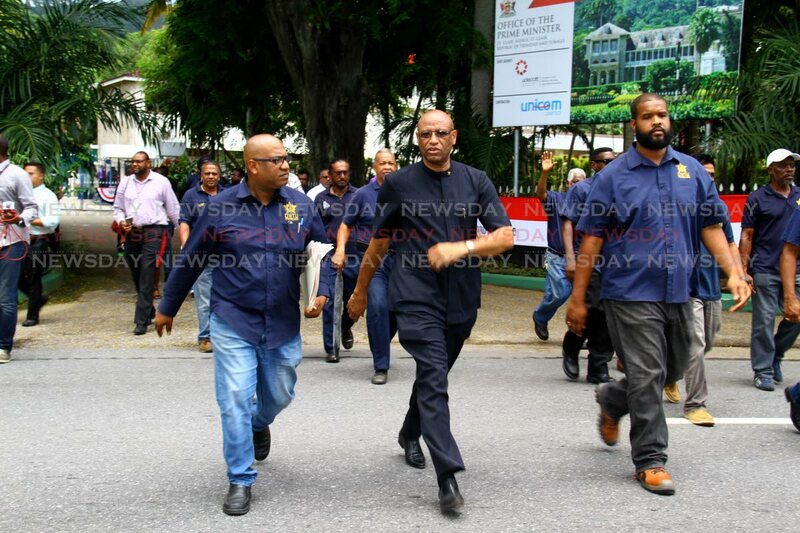 PRESIDENT GENERAL of the Oilfield Workers' Trade Union (OWTU) Ancel Roget called for a national discussion on the future of state-owned oil company Petrotrin and its workers, as he delivered letters requesting a debate between government and the trade union to the offices of the President, the opposition leader and the Parliament yesterday. Speaking with reporters in the Queen's Park Savannah, opposite President's House, Roget accused government of deliberately misleading the public by devaluing the refinery's true worth in order to put it up for sale. Responding to statements by the Prime Minister that Petrotrin requires a $25 billion cash injection to stay in business, Roget said the debt was exaggerated and he believes a national discussion would serve to inform citizens on which plan of action was best for Petrotrin's continued operations as government, he said, had not been completely honest about the company's debt. "For quite a while they have been undervaluing it and overstating all the issues with the state of the refinery, and the numbers they continue to provide to the public are contradicted by us (the trade union), and that is why we are saying it is important for us to have some kind of national discussion, so they can hold up their plan and we can hold up ours, to see which was better. "We are not saying the company is not in debt, but our point, going forward, is that the position of the company, in terms of its debt, is overstated. We have put forward an alternative plan going forward. "This refinery must remain in the hands of the people in one way or another," he emphasised. Reply to "Roget wants to debate govt"